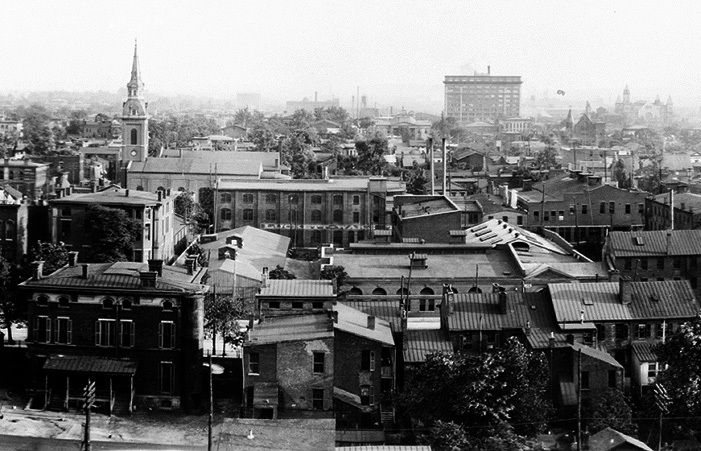 Louisville’s urban core was once an incredibly dense area. In the era of Urban Renewal, when large swaths of the city were razed en masse, though, much of the old city was lost. Take, for example, the area roughly bounded by Sixth or Seventh Streets, Market Street, Broadway, and 14th Street. 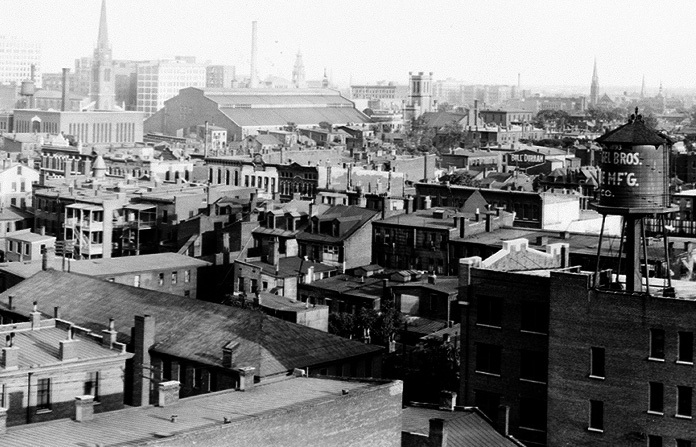 The view above is one small slice taken from a panoramic view looking south from the top of the Snead Manufacturing plant, now known as the Glassworks on West Market Street. That view was taken in 1906. Today, it’s a much different scene. The area in the photograph was literally decimated in the 20th century, and only a handful of structures still remain. Off in the distance you can see Union Station and the L & N building (before it was enlarged). Besides those landmarks, only a half-dozen or so churches and other buildings remain. It’s even more devastating when you take a look at the full panorama after the click. We went to the top of the Glassworks building this summer to recreate the view 103 years later. Today, the area is dominated by surface level parking structures, two high rise apartment buildings, the Beecher Terrace housing project and several other 20th century buildings. The new ZirMed Towers also dominate the view from the Glassworks. It becomes painfully apparent just what was lost: an incredibly fine urban fabric easily comparable to the French Quarter in New Orleans. In Louisville, though, such a scene was deemed a slum and slated for clearance. In it’s heyday, the area around Sixth and Muhammad Ali Boulevard (then Walnut Street) was the center of African American life and featured a lively urban vitality. 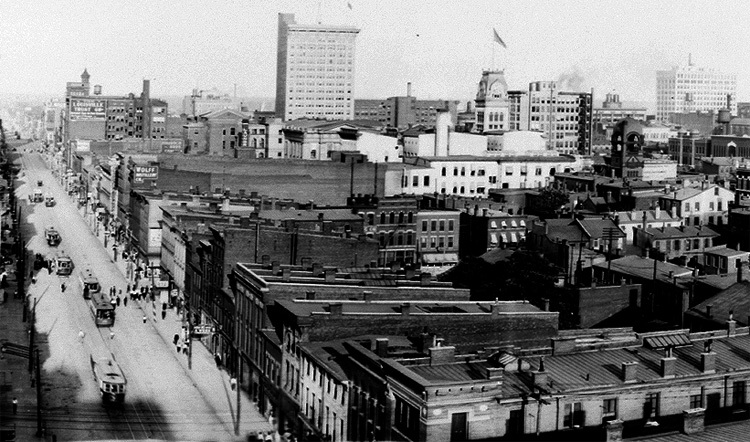 This part of Downtown went on for decades after this photo was taken in 1906 and in that time grand architecture and theaters filled the area. One structure from the 1920s, the 6-story Mammoth Life Building (once home to the Lyric Theater) still sits shrouded in 1960s garb on Muhammad Ali. Much of the architecture in the 1906 view features simple vernacular design, a hallmark of its day. The clean lines and human proportions of these structures would no doubt have created a fascinating streetscape. After the click, you can take a closer look at all that once existed. Just keep in mind that nearly everything you’re looking at is sitting in a landfill somewhere. Don’t forget to click on the pictures to open up an enlarged view. Because of the steep drop from the old Snead building and it’s lack of a parapet, I couldn’t venture safely to the edge of the roof, but the modern panorama still offers an amazing comparison. Special thanks to City Properties Group for allowing me to take the new panoramas from the roof of the Glassworks building. Wow! Great Pics! Its amazing to see Louisville then and now. The old Mommoth Life building is one of only 2 remaining structures of “Old Walnut” street. So sad. The Russell Neighborhood boundaries use to be from 6th street to 36th street. It was truly the Harlem of Kentucky. Well, it’s obvious from these photographs that in the last 100 years there has been an effort to disperse people away from urban densities to a more suburban life. This effort, to be fair, wasn’t the worst idea, considering that city life in the early 1900’s was crowded, dirty, etc . . . the conditions were probably awful I can imagine. What we have now is a population that is spread out across the entire county, with low density that is unsustainable. Maybe we can take the city back to it’s original density and granduer . . . I’m just worried that in the process we’ll kick out all the poor folks who already do live in it. It’s really amazing how much destruction the area in the photograph has seen. Old Walnut Street must have been a fascinating place in even 50 years ago. It’s true the 19th century city had its fair share of problems and it’s not helpful to gloss over them with nostalgia, we have learned in the 20th century that those problems are more nuanced than the approaches of urban renewal made them out to be. It’s not necessarily the built environment that caused these issues. While the lifestyle in 1906 was certainly primitive by our modern standards (and in some ways far advanced, i.e. transit), at the time this area was part of a thriving city. It continued to grow and change in decades following 1906. After WWII, with urban disinvestment rampant in cities across the country, contrasting this view to the bucolic new suburbs was sure to drive the idea of blight home. The alternative, however, of barracks-style public housing was no better and in many ways worse. What was often overlooked in the “shabby” and generally run down post-war city was the intact community support systems. By moving everyone out and tearing everything down, that fragile community was also destroyed. It’s interesting as well how historic neighborhoods here in New York built on the same pattern with even more density are now some of the most desirable in the city. There were problems with 19th century urbanism, but clear-cutting the city was definitely not the right answer. Gentrification will obviously come into play in the future, but there’s so much of the core of Louisville that simply doesn’t exist (with few or no people living there), there’s plenty of space to build without displacing people. In other areas, the tensions will be more pronounced, for good and ill, but that’s a conversation that’s going to take up more space and time.